(Interfax – MOSCOW, June 20, 2013) The Moscow City Court has failed to select the jury for the investigative reporter Anna Politkovskaya murder trial. A court representative told Interfax the Thursday attempt to form the panel of jurors was unsuccessful. A lawyer for the defendants said the majority of candidates refused to become jurors. “Everybody asked for withdrawal for various reasons – work, vacation or personal problems,” a lawyer told Interfax. The defense said there were only ten candidates left in the end and the court could not appoint a full jury. The court will try to form a jury again on July 17. 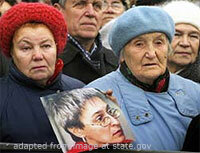 Politkovskaya was killed at the entrance to her apartment in Moscow on October 7, 2006. It was reported earlier that the criminal investigation against five persons suspected in Politkovskaya’s killing had been completed. They are Lom-Ali Gaitukayev, his nephews Rustam, Ibragim and Dzhabrail Makhmudov, as well as Sergei Khadzhikurbanov. They face charges of murder and illegal possession of weapons. The criminal case against another suspect in the case, Dmitry Pavlyuchenkov, who concluded a pre-trial plea bargain agreement, was separated. Pavlyuchenkov has been sentenced to 11 years in maximum security penal colony for assistance in organizing the murder of Politkovskaya. Pavlyuchenkov gave confessionary statements and concluded a deal with investigators. He said that businessman Boris Berezovsky and Chechen separatist emissary Akhmed Zakayev ordered the murder. Rustam Makhmudov is considered to be the murderer. On May 31, 2011, Makhmudov was arrested in Chechnya and brought to Moscow for investigative procedures. Makhmudov has been charged under four articles of the Criminal Code: murder, illegal possession of weapons, kidnapping and extortion. His detention has been prolonged repeatedly. “Having received information about where the victim lived from D. Pavlyuchenko, the Makhmudov brothers went to her route on October 7, 2006. Having seen the victim driving, I. Makhmudov informed his brother Dzhabrail, who then told Rustam, who went to the entrance of the building where Politkovskaya lived and started waiting for her to arrive,” the Investigative Committee said. According to investigators’ information, when Politkovskaya stepped into the elevator, R. Makhmudov shot her several times. “The crime instrument was left at the scene. The suspects fled after this,” the Investigative Committee said. Former Central Internal Affairs Directorate employee S. Khadzhikurbanov is serving time for another case. He was brought to Moscow to participate in the Politkovskaya murder case. According to the law, the court is to impose a pre-trial restraint to sanction Khadzhikurbanov’s detention.